1. Determine the single-drug efficacy of EZH2 inhibitors in Diffuse Large B-Cell Lymphoma. 2. Identify potential candidates for combination therapy with EZH2 inhibitors. 3. Determine synergy of combination therapy in vivo. We evaluated the effect of EPZ-6438, ABT-199, and their combination in a panel of GCB-DLBCL cell lines (SUDHL-4, SUDHL-6, WSU-DLCL2, OCI-LY1, OCI-LY7, and Farage). SUDHL-4, SUDHL-6, WSU-DLCL2, and OCI-LY1 harbor an activating mutation in EZH2 and a translocation involving Bcl-2. OCI-LY7 and Farage are WT for EZH2 and do not harbor Bcl2 translocations. EZH2 inhibitors have a delayed effect on cell viability, with maximal effect observed at days 6-10. In our combination experiments, we treated cells with EPZ-6438 for six days prior to adding ABT-199. Viability was assessed 24, 48 and 72 hours after adding ABT-199 using an ATP-based luminescence assay. Results were normalized to the vehicle-treated control. We also performed synergy experiments using the same treatment schedule but with escalating doses of EPZ-6438 and ABT-199, and calculated combination indices (CI) using the Chou-Talalay method. A CI value <1 is considered synergistic. SUDHL-6 and WSU-DLCL2 were both sensitive to EPZ-6438 and ABT-199 as single agents. SUDHL-6 and WSU-DLCL2 demonstrated increased sensitivity to the combination of EPZ-6438 and ABT-199, compared to cells treated with vehicle, (p=0.0001 for SUDHL-6; 0.0001 for WSU-DLCL2) EPZ-6438 alone, (p=0.004 for SUDHL-6; 0.0002 for WSU-DLCL2) and ABT-199 alone (p=0.0001 for SUDHL-6; 0.0012 for WSU-DLCL2). Isobolograms indicated synergy with this combination (CI at ED50=0.11980 for SUDHL-6, 0.26779 for WSU-DLCL2). We have found that the combination of EPZ-6438 and ABT-199 is synergistic in some DLBCL cells harboring EZH2 mutation and Bcl2 translocations. We will further characterize the optimal timing of this combination and validate results in the in-vivo setting. Summary: The EZH2 histone methyltransferase is a lineage factor for germinal center B cells, and EZH2 inhibitors are toxic to the germinal center B-cell subtype of diffuse large B cell lymphoma. 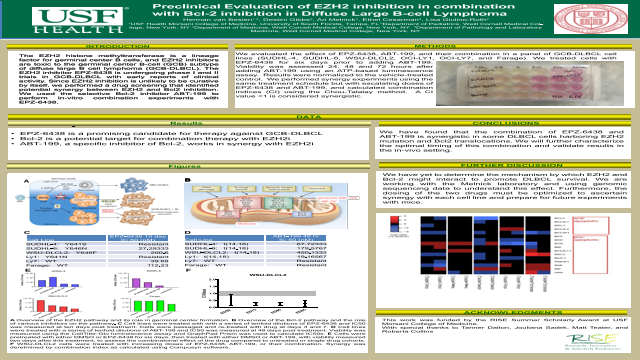 We performed a drug screening that identified potential synergy between EZH2 and Bcl2 inhibition. We used the selective Bcl-2 inhibitor ABT-199 to perform in-vitro combination experiments with the EZH2 inhibitor EPZ-6438.References: Beguelin W, Popovic R, Teater M, et al. EZH2 is required for germinal center formation and somatic EZH2 mutations promote lymphoid transformation. Cancer Cell. 2013;23(5):677-692. Knutson SK, Wigle TJ, Warholic NM, et al. A selective inhibitor of EZH2 blocks H3K27 methylation and kills mutant lymphoma cells. Nat Chem Biol. 2012;8(11):890-896. McCabe MT, Ott HM, Ganji G, et al. EZH2 inhibition as a therapeutic strategy for lymphoma with EZH2-activating mutations. Nature. 2012;492(7427):108-112.